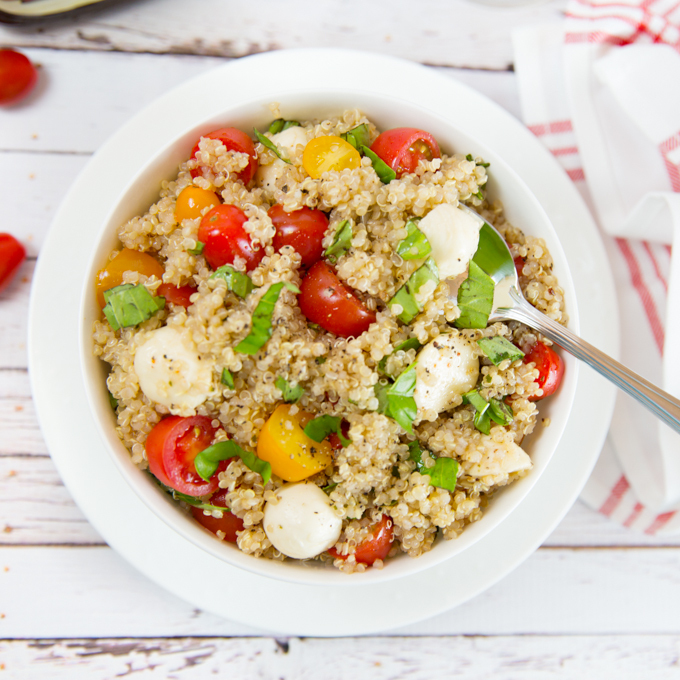 This Quinoa Caprese Salad is healthy and delicious! And if you opt for the easy method using a bottled dressing, it’s super quick to make. Win, win, win! 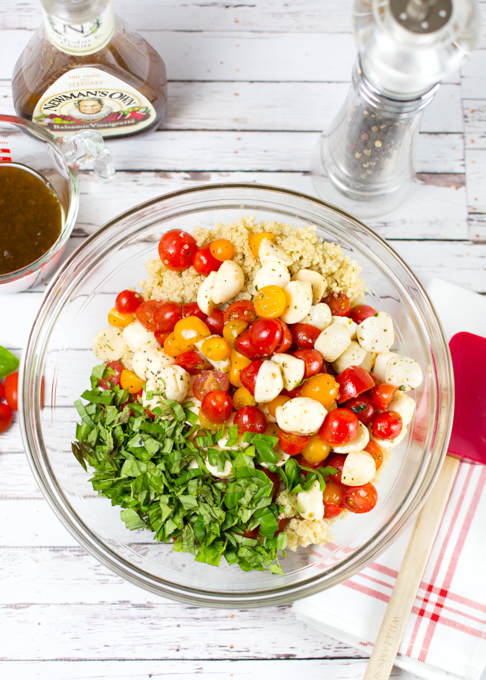 We love this salad and make it often during the summer. My tomatoes weren’t quite ripe yet, so I picked up some at the store along with the little marinated mozzarella balls. 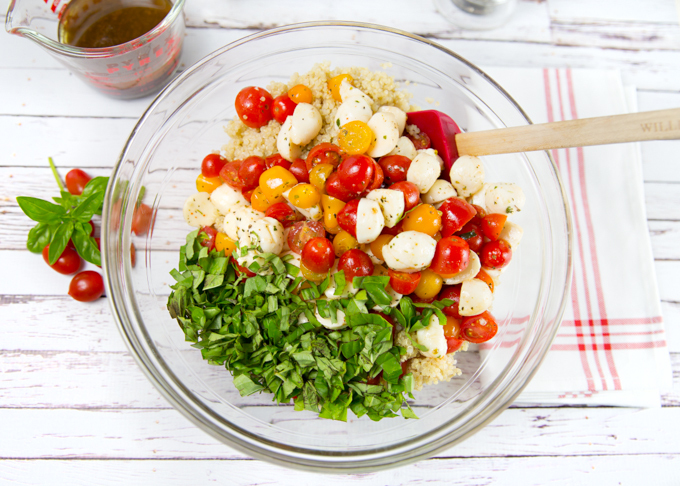 Fresh basil from my yard and a couple of pantry items were all I needed to make this light, refreshing, and healthy summer salad. 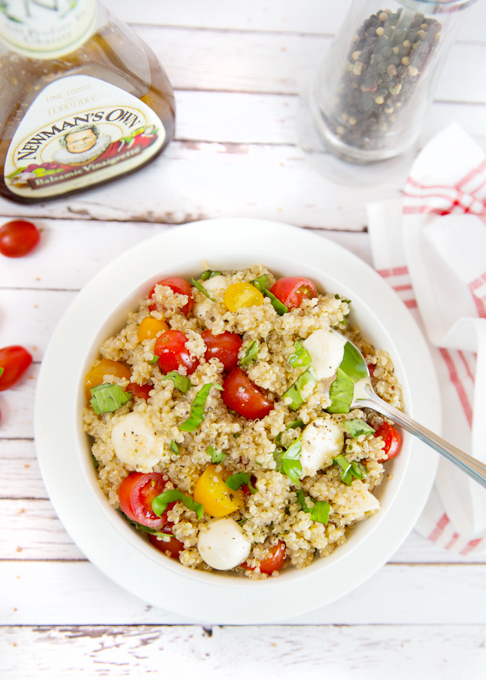 It is seriously as easy as slicing the tomatoes and mozzarella balls in half, chopping some basil, and mixing those, along with a little balsamic dressing together with some cooked quinoa. I believe we all know that quinoa is gluten free, high in protein, and easy to prepare, but this article will give you ALL the health benefits of quinoa, along with multiple other facts such as types of quinoa, how it grows, etc. I found this article, 27 Science-Based Health Benefits of Quinoa, to be interesting, informative, and definitely worth reading. 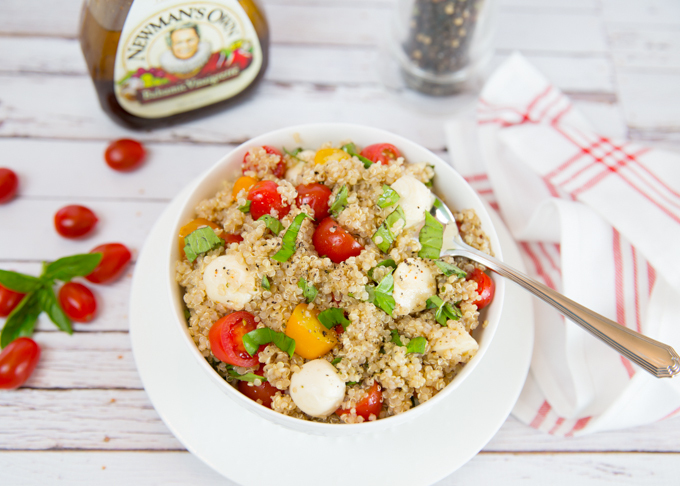 If you’re a fan of quinoa, make sure and check out my Quinoa Bowls. They’re a delicious simple one bowl meal! Remember, if you like this recipe, please feel free to share!! Cook 1 cup quinoa according to pkg directions, set aside to cool. In the meantime, halve the tomatoes and mozzarella balls. 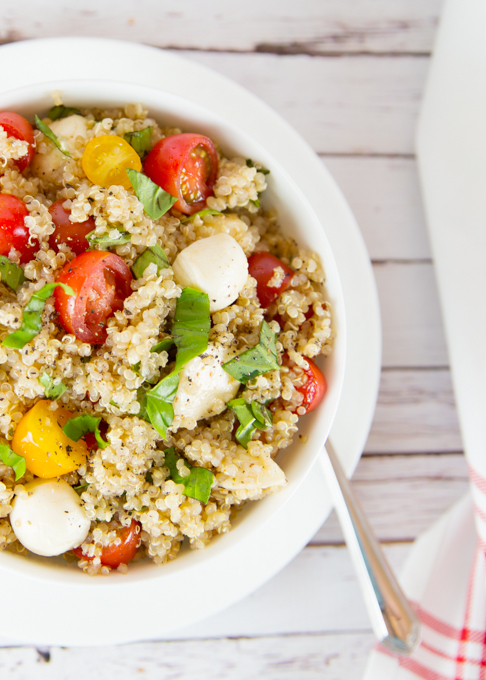 Mix cooled quinoa with dressing, tomatoes, cheese, and basil. Add a little more dressing if needed. Add fresh cracked pepper to taste. Place in refrigerator until serving. **If you aren't serving the salad right away, I suggest adding basil right before serving as it tends to brown a little. What a gorgeous salad – and so healthy too:) I’ll bet it’s easy to eat a bowlful of this delightful and delicious salad. So easy and flavorful Renee. I love caprese in summer! This looks perfect for a weeknight dinner around here in the heat of summer. Thank you!